Microsoft announced plans last week to increase storage for OneDrive for Business customers to unlimited from the previous 1TB limitation. If that sounds to you, it is because the company announced the same feature for all paying Office 365 customers some time ago only to revoke it afterwards again. Not only did Microsoft reduce storage for paying customers from unlimited to 1TB of storage on OneDrive, it furthermore canceled the 100Gb and 200GB plans on OneDrive, and replaced them with a 50GB plan that cost the same amount of money as the 100GB cost previously. Free users were affected by the changes as well, as their free storage was removed from whatever they got to 5GB. Microsoft in December changed its mind slightly in regards to free users by letting free users keep their 15GB or storage plus the 15GB extra camera roll bonus if they'd "sign up" for it. The announcement made waves on the Internet but will likely be overlooked by many existing OneDrive users on the free tier still. The changes to OneDrive for Business storage were announced last week by Microsoft corporate vice president for OneDrive and SharePoint Jeff Teper on the official Microsoft Office blog. Microsoft plans to roll out a storage increase for OneDrive for Business plans at the end of the month (December 2015). Storage will be increased from 1TB per user to 5TB per user, and the company plans to complete the rollout by March 2016. Teper notes that organizations can request a storage bump beyond 5TB by contacting Microsoft support. All other OneDrive customers, subscribed to all Enterprise, business and standalone plans not mentioned above, wont have their storage quota increased beyond 1TB. The same blog post mentions other changes. One is the release of the OneDrive for Business new generation sync client that is available for Windows and Mac computer systems. It features improved reliability and performance, selective sync, support for large files up to 10GB in size, and no 20,000 file sync limit as it has been removed by Microsoft. IT professionals can deploy the new sync client for OneDrive silently for end users. One limitation us currently that the client does not support SharePoint document libraries, but Microsoft plans to integrate those in the future. That's one reason why the new sync client works side-by-side with the old client. Microsoft is working on "other important features" such as Office integration to support the co-authoring of documents and sharing scenarios. The preview sync client will be updated automatically to the release version according to Microsoft. 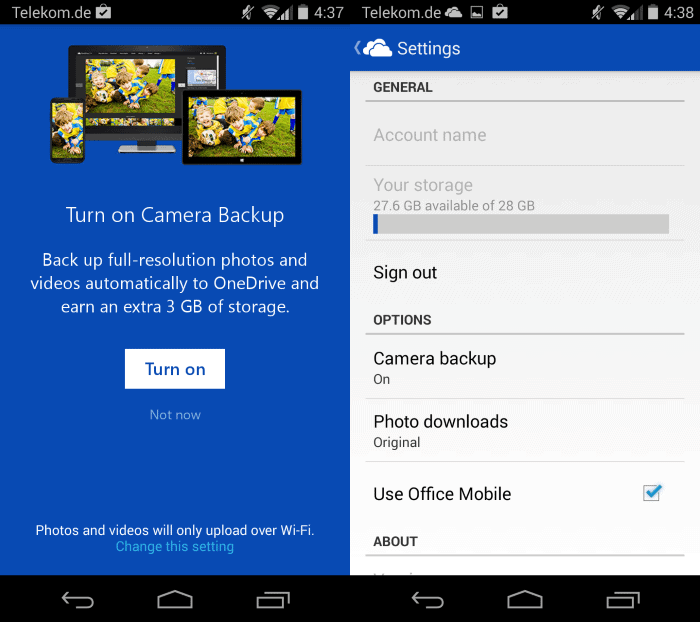 The OneDrive mobile applications have received updates as well. Microsoft released a new OneDrive app for Windows 10 Mobile for instance and added support for offline storage to OneDrive for iOS (the Android app got the update in September 2015 already). OneDrive customers who had their unlimited storage revoked by Microsoft are probably wondering why Microsoft decided to go the "unlimited route" once again, and why it decided to exclude them from the deal. One possible explanation is that OneDrive for Business customers are less likely to take advantage of the unlimited storage offer but things don't really add up in the end, and Microsoft's timing of events does not really help either. One could even come to the assumption that the company had to free up storage from regular paying customers to provide businesses with the extended storage opportunities. Microsoft announced recently that it made the decision to increase OneDrive for Business plans from 1TB storage to unlimited storage. Hi, just letting you know, your link to “One Drive Alternatives” actually takes me to Microsoft’s One Drive Blog. Thanks, I have corrected the link! In the last six months too much of what Microsoft has done has been confusing or worse. In January I was excited for their new direction with HoloLens and more Now, it seems that the hopeful new direction was overly enthusiastic wishful thinking on their part. They keep tripping over themselves in Redmond. Get 25 gigs free…after a period of time…well, we’re gonna reduce it to 7 gigs, sorry! You can buy 100 or 200 gigs of storage if you need it!…after awhile..we’re taking away that offer but HEY! we’ll sell you 50 gigs of storage for the price of 100 gigs! Honestly, they cannot be trusted to keep their word regarding storage. Fool me once–shame on you, fool me 5, 6, or 7 times, shame on me. Personally, I am seriously considering setting up OwnCloud. Right businesses can be trusted not to abuse the unlimited storage (said with heavy irony). Volkswagen (just to name one) is sooo trustworthy. Haha. Well, you can NOT actually “abuse” an offer of unlimited storage. If a company says it’s unlimited, and you begin uploading large amounts of data, then you have done NOTHING wrong, and are NOT abusing their offer in anyway. For Microsoft to try and blame innocent people who simply took them up on their stated offer, and thus did nothing wrong is reprehensible. In fact I would argue it is Microsoft who is the one who was being abusive, misleading, and taking advantage of its customers through FALSE ADVERTISING (by claiming a service was unlimited, when in fact it was not). If it is not really “unlimited” then they should say so, and not engage in false advertising practices. In short… the last time I checked, “UNLIMITED” means just that: unlimited! Perhaps Microsoft’s advertising/marketing department is in need of a good old fashioned Oxford dictionary, to keep handy at their desk. I am sure they will wait until everyone uploads their mission critical data and will do the same as before – remove unlimited access. I cant wait to watch this! I am a longtime Microsoft Partner. I used to be a SkyDrive Insider, back in the day. I was a fan of Microsoft Mesh AKA Windows Live FolderShare, Live Mesh, and Windows Live Sync. OneDrive for Business (ODfB) has always been based based upon Groove, a Microsoft acquistion. It was always inferior to its consumer counterpart. When Office 365 Enterprise launched they included ODfB with 1TB of storage. They then announced it would become unlimited and then, never having fulfilled their promise, changed the rules once again. ODfB has never been a reliable service. It crashes and screws things up. I have stopped using OneDrive and ODfB because they are unreliable services and Microsoft’s policies are too changeable. I now use and recommend Google Drive and Dropbox. It is unlikely I would ever recommend a Microsoft sync and cloud file service again. As much as I’m no fan of Microsoft the company it seems they have good ideas that later get ruined, i would assume, by management, they have great ideas and then someone attempts to use it for a business goal. Honestly, my first reaction was to wonder if anybody is not laughing. With their penchant for arbitrarily renaming, revising and replacing everything, Microsoft resembles nothing so much as a sociological and business experiment to see how long being a de facto standard for office software can save them from deliberate self-destruction.